A Secure PKI is imperative for the operation of electronic invoicing. VirtuCrypt Elements Electronic Invoice Signing allows users to track and receive invoices while simultaneously ensuring any given invoice’s integrity and authenticity. 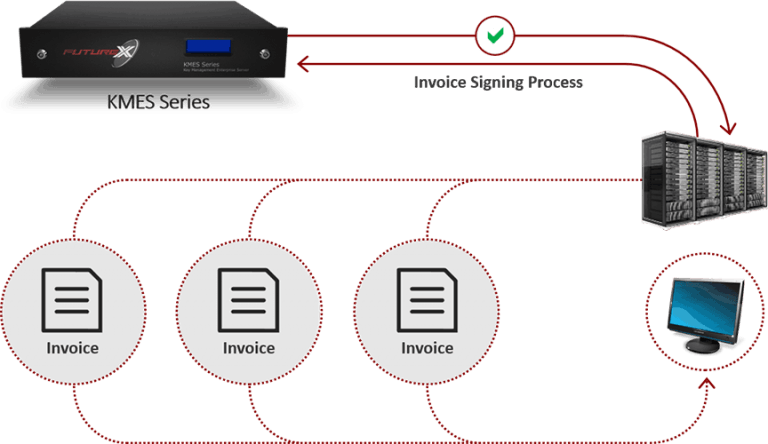 VirtuCrypt Elements Electronic Invoice Signing secures the private key used for signing invoices through cloud-connected hardware security modules (HSMs). An HSM allows for the binding of signatures to invoices, while eliminating the possibility of third-party manipulation or interception. When interacting with clients, your organization’s reputation will be bolstered by trusted communication, ensuring long-term success and return on investment. This service is highly useful for everything from simple object validation to more complex enterprise ventures. By securing invoices, organizations stay at the forefront of the security industry’s standards. Without securing the private key, attackers can easily create invoices with the impression that they are generated by a different, authenticated party. Looking to learn more about signing operations? Discover VirtuCrypt Elements Object Signing and Code Signing.